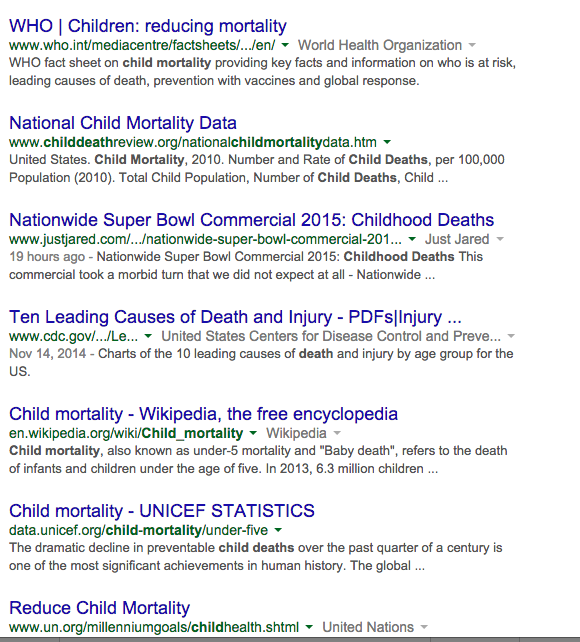 the 77 million results and you'll find information from the CDC and WebMD and UNICEF and a range of advocacy groups. You'll find quite a few stories from traditional media on the Nationwide Super Bowl ad. What's not there are stories from major media on the problem of accidental deaths. Congratulations to Nationwide. It brought attention to an important issue. Will the press do anything more than do stories on the commerial? Let's hope so. Watch a commercial that's worth watching, and one that will probably prevent some family tragedies.